Hybrid Cloud management is an interestingly hot topic for today’s cloud world, since not all companies want to move everything to the cloud. 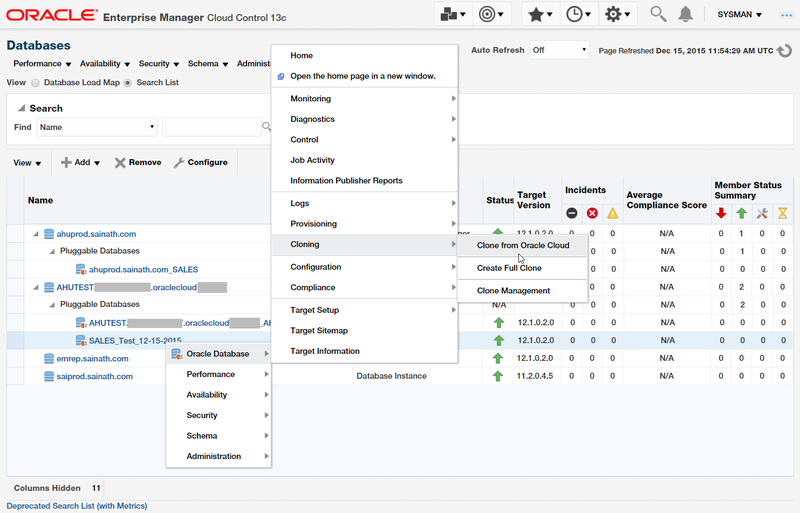 In this article series, we are looking at the detailed steps for setting up the Oracle Hybrid Cloud via the latest version – Oracle Enterprise Manager Cloud Control 13c installed on premises. Our main intention is to install an Enterprise Manager hybrid cloud agent on our database cloud servers (on the Oracle public cloud) via the hybrid gateway, in the scenario where our company has databases running on premises as well as on the Oracle public cloud, and then to look at hybrid cloud management using Enterprise Manager. Next, we looked into the cloning of PDBs from on premises to cloud, one of the main features of the hybrid cloud. To proceed with the actual PDB cloning, we made sure the source and destination CDBs were at the latest PSU. We then went through the steps to preserve the Enterprise Manager agent home when patching the cloud database. Next, we started the Clone to Oracle cloud process. This was done via right-clicking on the on-premises PDB “SALES”, which is in the ahuprod CDB, and selecting Oracle Database | Cloning | Clone to Oracle Cloud. If we had selected the Masking definition as a part of the cloning workflow, we need to verify that the employees table data has been masked. We connected to the on-premises ahuprod CDB as sysdba, and selected from the hr.employees table to examine the original unmasked data. Then we checked the same rows in the cloud PDB. We observed that the employee data has been masked successfully, as per the masking definition that was selected during the clone to cloud procedure. Another point to note is that if the APEX versions on the two databases (on-premisse and cloud) do not tally, the plug-in of the PDB to the cloud database during the cloning process may not complete successfully. The PDB on the cloud database may be left open in restricted mode. This will be seen when we try to drill down to the new cloned PDB in Enterprise Manager, and it tries this for a few minutes and then reports that the PDB is in restricted mode. The reason can be seen in the view PDB_PLUG_IN_VIOLATIONS on the cloud database, the Message column shows an “APEX mismatch” between the PDB installed version and CDB installed version. We verified that the APEX versions are different via the commands “select version_no from apex_release;” and “select comp_name, status, schema from dba_registry where upper(comp_name) like '%EXPRESS%'”. After this was complete, the on-premises had the correct APEX version. This was verified again via the commands “select version_no from apex_release” and “select comp_name, status, schema from dba_registry where upper(comp_name) like '%EXPRESS%'". It is also possible to clone PDBs from the Cloud back to on premises. For example, we complete our development on the cloud PDB, and then bring back the PDB to an on-premises CDB for testing purposes. Select the Cloud PDB, right-click, and select Oracle Database | Cloning | Clone from Oracle Cloud (Figure 36). This procedure will bring the PDB back to the on-premises CDB.